For your convenience, we have Google Translate compatible pages. To translate our website to another language, please scroll down to the bottom of the page and click on the drop down menu that says "Select Language." A completed International Student online application by the parent, guardian, and student. A copy of student passport. Interview (in person or phone or Skype) with student and parent and/or guardian. During this interview the student's English-speaking level will be evaluated as the interview questions are asked. Students should answer the interview questions as thoroughly as possible to accurately show their ability to communicate in English. Official transcripts from the last two years signed and sealed. Official transcripts must be translated into English. If accepted we will also need the student’s current official end of the school year transcript. This transcript must also be signed, sealed, and translated to English. Complete record of immunizations, translated into English. Admissions decision by AHS Admissions Committee once all of the above steps have been completed. The application will not be processed until all forms are received by AHS. The personal interview is administered by our Admissions and Marketing Director. The interview is with the applying student and with the parent/guardian (if possible) for about 30 – 45 minutes. This is done in person at AHS or over a webcam with Skype. The interview does not take place until the application is completed. Following the decision for admission by the Admissions Committee, the acceptance letter and enrollment information is sent to the student. When the student arrives in the U.S. additional testing may be required to help with placing the student in the right classes or grade level. International students are not permitted to enter AHS for the 12th grade only; they must begin in grade 11 or younger. 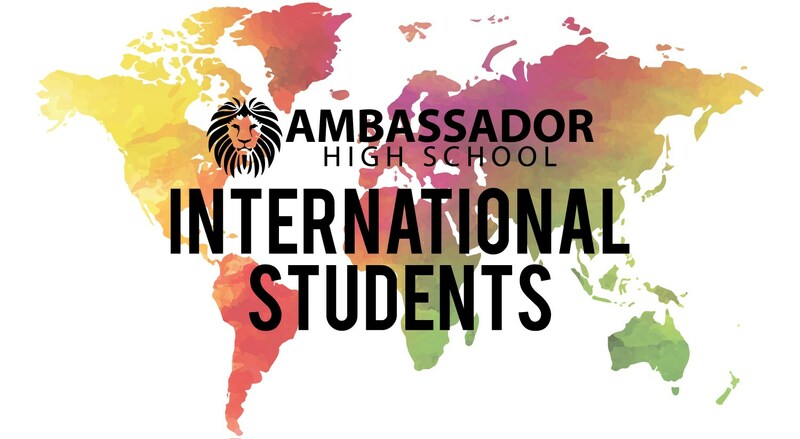 Exceptions to admit 12th grade international may be made if the student has attended multiple years of U.S. schooling prior to Ambassador. While single semester applicants are welcome to apply, the Ambassador Admissions Committee gives admissions priority to international students applying to at least one full academic year or longer. Upon acceptance to AHS, and after the receipt of the International Student Enrollment Contract and Administration Fee, the I‐20 will be issued to the student. This document is the basis for receiving an F‐1 visa status from the United States Department of Homeland Security. Within two weeks before starting school, the student is expected to secure medical insurance and make sure all immunizations are up to date to attend school. Specific California Interscholastic Federation (CIF) and Central Coast Section (CCS) laws apply to sports participation for international students. International student applicants should request athletic eligibility during the admissions process if school sports teams participation is desired. AHS does not discriminate among its students on the basis of religious belief. It does not, in the operation of its school, favor or disfavor students on the basis of their religious beliefs such that a reasonable student would assume that the benefits of the school would be more likely conferred upon him or her if the student adopted certain religious beliefs or practices. It does not impose requirements that would tend to discourage prospective students of different religious persuasions from making application to the school or students of different religious persuasions from availing themselves of the school’s programs. For more information, please contact our International Student Coordinator and Academic Dean, Jeff Silva. jsilva@ambassadorhigh.org, 310.356.1950.